Why It’s Hot: Mark Waid and Chris Samnee’s run on Captain America comes to an end in this explosive, super sized anniversary celebration conclusion to the Out Of Time arc. 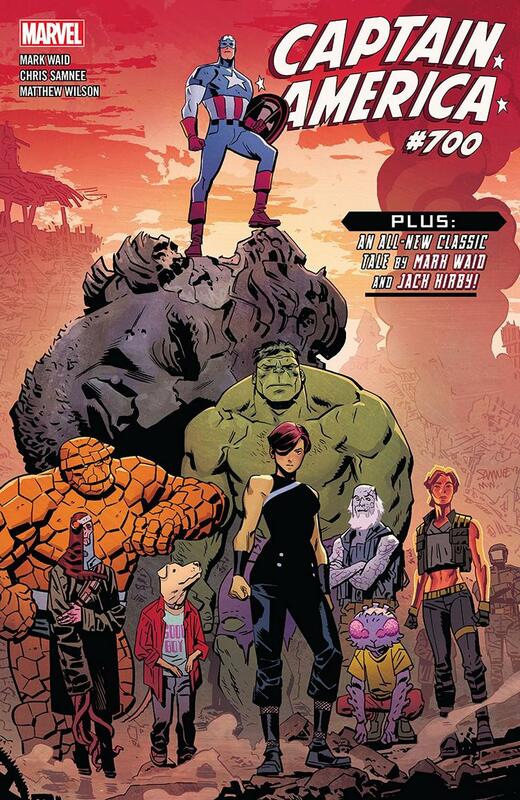 This anniversary issue not only sees one of the great creative teams in modern comics wrap up their brief love letter to the Sentinel Of Liberty, but also has Waid scripting a new Jack Kirby story? Wait? What!? If that wasn’t cool enough that story also sees Matt Wilson coloring Jack Kirby’s art. That’s one of the best colorists of today working his craft on the pencils of arguably the greatest comic book artist ever. Now that is cool. Impossible curves. Impossible shots. Impossible targets. Marvel’s #1 soldier of fortune is back in an explosive new ongoing series! The product of a failed super-soldier program, Neena Thurman always made her own luck as the sharpshooting mercenary known as Domino… but what happens when her own powers betray her? The hunter becomes the hunted as every mercenary in the game smells blood in the water! Plus: A pair of beloved Marvel characters return. Why It’s Hot: Gail Simone’s return to Marvel after years away is upon us, and does not disappoint. Not only is Domino a must read for X-Men fans everywhere, but it’s also one for readers that love Simone’s writing, and/or want more female led comics written by a woman in their lives. Everything about this comic is a delight, and any doubts you had about Domino being the character that brought Simone back across the aisle will be erased almost immediately. 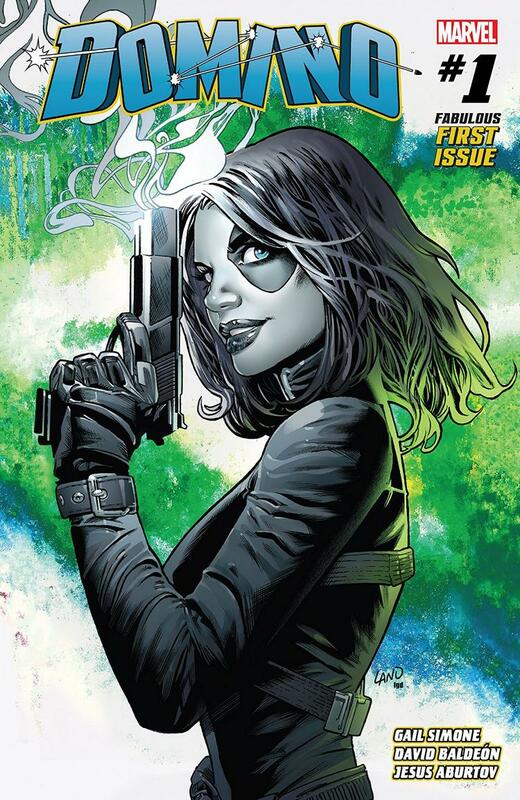 I wouldn’t be surprised if this comic does for Domino and her friends something similar to what Simone’s Birds Of Prey run did for those characters. A big part of this comic’s success will be the perfect marriage of writer, artists, and characters. I wouldn’t be surprised if this was the beginning of a nice long working relationship for this creative team. If you couldn’t tell I’m quite excited for this comic, and you should be too! Why It’s Hot: I might be a bit biased here. My two favorite characters in comics are Superman and the Age Of Apocalypse Blink. I can go on and on about how this version of Blink was in the first two comics I ever read as an eight year old kid, and how my love of the character lived on through over a hundred issues of Exiles and New Exiles she appeared in through the years. I won’t though. I’ll focus on the amazing creative team that is putting together a fresh new take on this concept that will take the Exiles to new heights. Javier Rodriguez is one of the best and most innovative artists around, and his work is made even more beautiful with the always stunning color work of the great Jordie Bellaire. Then there is Saladin Ahmed. The writer has been on an absolute creative tear over the past year or two. His stunning work on the recently concluded Black Bolt, and awesome creator owned series Abbott have been some of the best reads here in 2018. 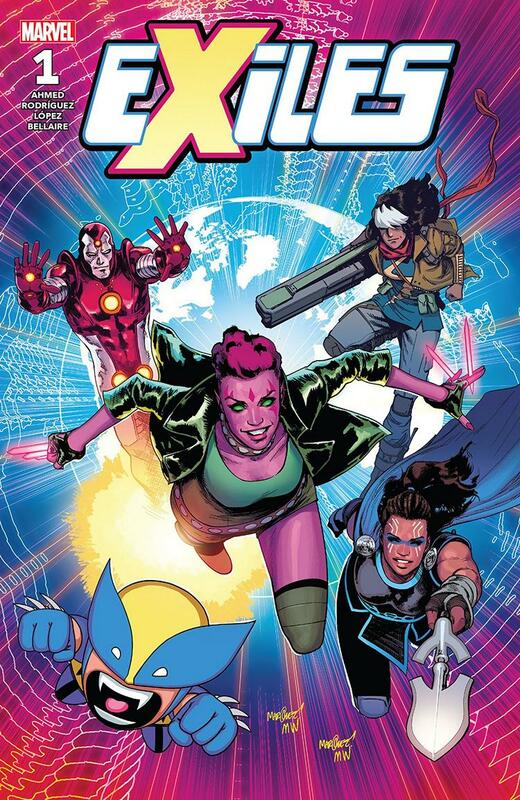 Getting this team together on an awesome concept like the Exiles, expanding the concept’s scope to include the entire Marvel Universe, and bringing in the cast of characters they’re bringing in will be one of the best things Marvel does in 2018 (or 2017 when I’m assuming this all got started on). “THE END OF FOREVER” part one! There is a secret history to the DC Universe of heroes who have protected humanity from the shadows since the dawn of time…and who can live forever. Enter the Immortal Men! The team, headed by the Immortal Man, has waged a secret war against the House of Conquest for countless years-but Conquest has dealt a devastating blow. When their base of operations, known as the Campus, is savagely attacked, the Immortal Men must seek out their last hope-an emerging metahuman known as Caden Park! Caden’s emerging powers may be able to ensure the Immortal Men’s survival-but will Conquest get to him first? 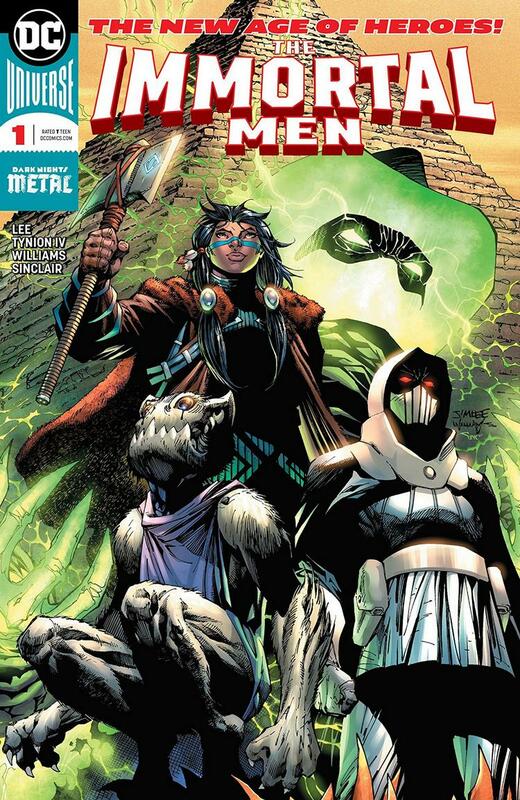 Why It’s Hot: Dark Nights: Metal may be over, but the fun is just beginning! The always reliable James Tynion IV is teaming up with the living legend Jim Lee (among others) to bring us the adventures of The Immortal Men. We saw glimpses of their story during the events of Metal, but seeing them fleshed out here is quite exciting. Given the name of the titular group you can expect a different perspective on the history of the DC Universe to be explored throughout the course of this series, while the future may just depend on them as well. This is arguably the MUST READ series out of all the “New Age Of DC Heroes” f.k.a. “Masterclass” comics. Why It’s Hot: Donny Cates and Geoff Shaw took over Thanos with relatively little fanfare. Sure, some of us that had read the duo’s precious indie collaborations were intrigued, but we didn’t expect THIS. 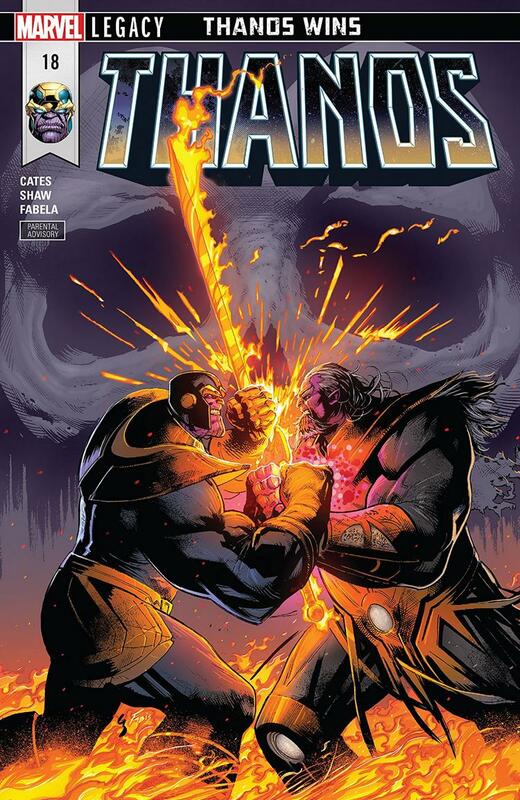 Through five issues Cates, Shaw, and the rest of the creative team have done more for Thanos than just about any creative team before it that didn’t have Jim Starlin in it. This comic took the comic book world by storm, and strapped a rocket on Cates’ back as he heads towards superstardom. It’s hard to believe that this team was able to make such an impact in such a short amount of time. It’s because every issue was packed to the gills with wild action that just kept on delivering. We were also introduced to the great Cosmic Ghost Rider, who is even getting his own spinoff series this summer. It’s a bit sad seeing this run end so soon, even if it was always meant to be one arc, but damn if it isn’t going out strong! If you want to get even more excited about a little movie coming out this month, this arc will definitely do that by showing you just how awesome The Mad Titan can be.